My limo rolled up to the station at 9:55; my body guards escorted me inside, and then it didn't happen. No screeching tires because I had forgotten my sound effects CD. No worries, next Sunday I'll screech them tires twice to make up for it. It occurred to me the other day that if people know me around campus, it is probably due to my radio show, but not to the show itself, but rather to the promo that airs regularly on the station. It's been awhile since I've updated it, and to tell the truth I'm tired of it, with the "musical cornucopia" line ... although I still like the line about snatching the airwaves away from the electric guitars. I have a text ready to record a new promo, but with time I'll probably get tired of it as well. Anyway I'm going to do it. Joe Sample passed away the other day, so we listened to him cover Jelly's "Shreveport Stomp." Featured some doo-wop. I don't know exactly what the charm of doo-wop is. First, just something about vocal harmonies (although in general I don't care for a cappella groups), but also I think the imperfections, the slightly out-of-tune notes lend the music a certain charm. And in general the singing is great. I played a half-hour Nick Lowe set for Susan, and dug every second of it. As is well known, I love me some Nick Lowe, and I'm happy to have passed this passion on to Susan. 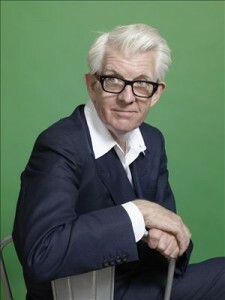 Nick Lowe reminds her of her dad Herb. Not because they look alike or sound alike, but just because of their easy-going approach to music. Speaking of Susan, she wins the cover contest for the first time. I was psyched that there were four entries this week. Only the second time in the history of the cover contest that somebody other than Jim Dandy or Mary Ellen wins. Anyway, I was happy that she won! 1. What's the tune and who are playing it? - "Old Man River" / Chet Atkins & Jerry Reed. 2. "Crazy." Who wrote it, who's playing it, and who recorded the quintessential version? - Willie Nelson, Neil Young, and Patsy Cline, respectively. 3. "Anything Goes." Who wrote and which handsome man is singing it? - Cole Porter, Tony Bennett. 4. Which two songs are being mashed up, who is singing them, and who are the original artists? - "The Joker" and "Everything I Own." Jason Mraz and Chrissie Hynde. Steve Miller / David Gates and Bread. Congratulations, Susan! Welcome to the champions club. I totally didn't recognize Old Man River and should have. My first guess on that was Chet Atkins and Roy Clark and then I thought I heard Waylon laugh so changed it to him and Willie. Did you see my eraser marks on the test? Then on the last one, I was thinking the lyrics were, "I would give every thing I own, just to make it with you." Oh well, thank you for wrestling the airwaves away from the classic rock for awhile. Always a cornucopia of good times!